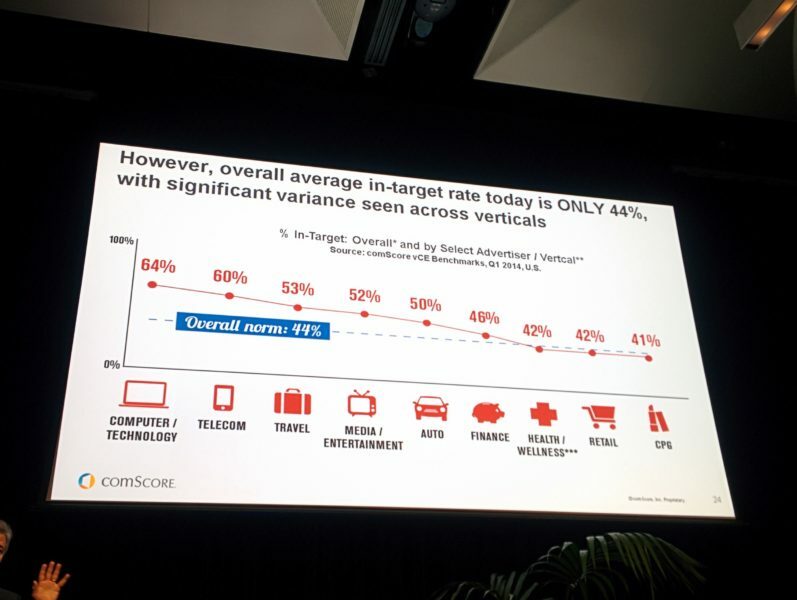 Today’s second keynote comes from Gian Fulgoni from comScore, who is discussing the evolution of our understanding, usage and tracking of digital advertising in Australia to-date and over the coming year. Comscore has a panel of 2 million people that sends back information from clickstream to search to ads shown to videos viewed and purchases. That is then combined with direct feeds from around 1 million domains from around the world. This is also combined with 3m set-top TV boxes. This then produces as accurate a measure of internet behaviour as feasible. seeing huge growth over the last 12 months. Australia is ranked as the 18th largest internet user base (in terms of millions of monthly unique visitors). China is by far the largest with 22% of global internet population, with Brazil and India having the highest possible growth rate. 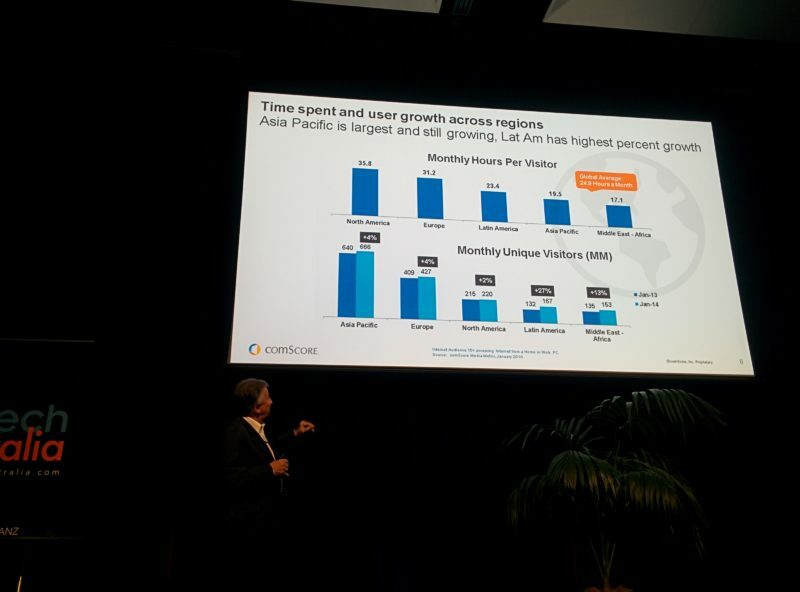 However Australia ranks higher than both India and Chine in terms of average time spent per person, with an average of 24.9 hours per month. Expect this to change significantly and quickly as these countries continue to grow. China, India and Singapore tend to have a much younger internet user base. China, for example has a 60% internet user base under the age of 34 while Australia is much more evenly split across main age groups. Unsurprisingly the internet user base is under represented by older demographic segments across all countries. Australia ranks pretty high in terms of social reach, with about 88% of the total internet user base in the country using social networks in a given month. This is for around 35 minutes per day. This is higher than France, Germany and other key European countries. If you compare the relative size of spending in digital vs television, UK’s digital spend already far outweighs its television. This may be skewed by the fact that channels like the BBC do not carry advertising. Australia has almost equal digital and television media spend at around 30%, while the USA has a much greater focus on TV. However if we compare search focused advertising vs brand focused advertising, the US actually has a much greater focus on brand while Australia drops to a 70/30 search/display focus. The future is all about cross platform measurement, the focus is no longer on ‘the click’. In 2009, comScore produced over 200 studies to asses behavioural impact of paid search and online display ads. Even with click rates as low as 0.1%, you still see increased visits, brand search queries or building online and offline sales. There is no correlational relationship between click-through rates and sales lift. It’s not realistic to expect to have 100% perfect target for your display ads. This could be related to many issues including outdated demographic data or multiple users on a single computers. Average in-target rate is only 44% at present. Unsurprisingly as the age and gender target narrows, the accuracy drops. Cookie deletion is a global reality and causes frequency to be higher than planned as ad servers keep delivering impressions to browsers that have had their cookies deleted. Arguably the most important digital advertising initiative to date was the Making Measurement Make Sense (3Ms) mission. The aim was to improve the reporting of ad exposure and bolster confidence that ads delivered are actually viewable. This is defined as 50% of pixels are in view for at least one second. Average in-view rate is only 46% with variance seen across verticals. This is a bigger problem, and a bigger opportunity, than the targeting issue. What kind of sites are generating higher viewability than others? The viewability is significantly higher on premium sites than on those exchanges, where you aren’t 100% aware of where your ads are landing. This metric is growing in importance, with a likely growing focus on viewability rates over the coming months. Total time spent on the internet over the last 3 years has doubled. We need the right measurement systems to better understand how this time is being spent. Engagement for many content categories is incremental but for others there is significant cannibalisation. e.g. weather. As people own more devices, the total time they spend consuming content massively increases. As an example, this doubled during the 2012 Olympics when comparing just television to televion + desktop + mobile + tablet.